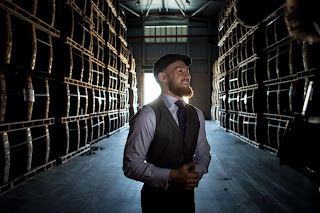 UFC star, Conor McGregor - Irish Whiskey is here! It has been selling so fast in Ireland that it is limited to 2 bottles person at many places! We have it in stock now! MILLING & MASHING: The finest barley is steeped, germinated and gently air dried. Using a traditional roller mill, the malt barley is then turned into a fine grist. FERMENTATION: After mashing, the natural fermentation process produces the wash (essentially beer) with over 8% alcohol. DISTILLATION: The traditional triple distillation method uses copper pot stills, which create and fine-tune the proper character. After the first distillation, the strength of the spirit is increased through a second distillation with a low wine still. A third distillation in the spirit still, creates a cut above 80% alcohol. This captures the heart of the spirit. MATURATION: Our coopers hand-select the finest former bourbon barrels in which to age our proper whiskey. Our spirit slowly ages developing through the years flavours of vanilla, honey and toasted wood. BLENDING: The blending of sweet Irish grain spirit and single malt Irish whiskey lies at the heart of Proper No. Twelve. Our Master Distiller selects casks that hold the rich character needed to craft Proper No. Twelve Whiskey.